This Web page is a summary of the changes in the boundary designating Mt. 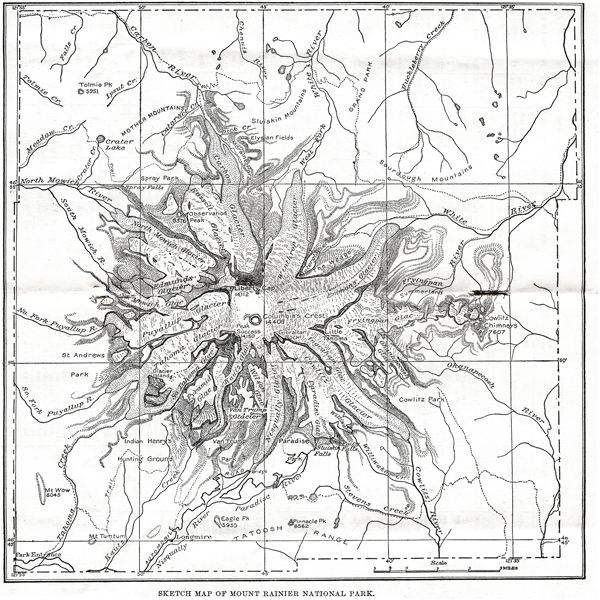 Rainier NP from the original designation in 1899 with the subsequent years when lands were added to expand the NP or include adjacent lands for the better management of the NP resources. Like any fight for pubic lands, especially a national park, the fight to get the law introduced and then passed and signed took years. While the original law was introduced in 1893, the work for it started over a decade earlier from several Tacoma civic groups, a few recreation organizations, mostly mountaineering clubs, a few scientific organizations, and a few federal agencies, namely the US. Geological Survey. The work to get the Act designating Mount Rainier National Park was passed by Congress and signed into law by President McKinley on March 2, 1899, see original text of the law. The law set aside an 18 miles square park from the then existing Washington Forest Reserve established in 1893, which was renamed Mount Rainier Forest Reserve in 1897. 1899.-- The Act designating the NP boundary defined an 18-square mile area of land originally thought to be square, but when surveyed on the ground, had kinks on three sides for the local Township and Range system used to delineate the boundary, see map above. It wasn't too many years later that the boundary did not include all the lands to preserve the area around Mt. Rainier and to accommodate all the future visitors to the NP, and so the work to accomplished this was finished with the 1931 law which expanded the NP with new boundary designation on three of the four sides. 1931.-- The NP boundary was revised slightly in 1926, but the real change to the boundary came in 1931 when the NP was significantly expanded on all four sides but mostly in the east and southeast. In the northeast the boundary was changed from the corner to follow the White River for a short distance and then east to the divide on Crystal Ridge, then following the divide south to the crest of the Cascade Mountains near Sourdough Gap. From there the boundary follows the crest south to the peak between Two Lakes (east of divide) and Three Lakes (west of the divide) in the southeast part of the NP. At that point the boundary turns to the southwest along the northern divide of Carlton Creek (Cowlitz River basin) to the center point of section 9, Township 14 North, Range 10 East. From there the boundary goes west to the Cowlitz River, then follows the southern-western line between Township 14 and 15 Nort to the Nisqually river. This corrected the jog in the western to eastern line between these two townships to become a straight east-west line originally intended in the original 1899 designation. From there the boundary follows the Nisqually River to the southwest corner of the NP. The western boundary was unchanged to the northwest corner with the addition of land from the northwest corner to the Carbon River, following the path east to where it intersects the northern NP boundary. The goal of these changes was the inclusion of lands to better protect the forests and rivers around Mt. Rainier and to accommodate the future visitors with a better experience and provide the opportunity for more roads, facilities and trails in the NP under the NPS management. The boundary remained the same until the 1988 Act. 1988.-- The Act added two new parcels of land to the NP. The first is the along the southern boundary in the southeast (Ohanopecosh entrance) area of the NP along the Backbone Ridge. This addition extended the NP boundary along the Backbone Ridge to fully include the Stevens Canyon Road (Highway 706 between Paradise and Highway 123) into the NP. The second was the first addition along the western boundary adding a small parcel of land from the USFS along Klapatche Ridge for the old Westside Road between Highway 706 between the Nisqually entrance and Longmire and the end of the Westside Road at the North Puyallup River. Both these parcels give the NPS better management of the resources with in the NP, not having to negotiate work with other agencies. A third change was made but this time land was removed from the NP for the USFS management of lands at Crystal Mountain Ski Resort. A small parcel of land was ceded to the USFS for the operation of the ski lifts along the divide of Crystal Ridge. The land removed the conflicts between NPS and USFS missions and use. 2003.-- The most recent addition is the inclusion of the exclave outside the northwest, Carbon River, entrance. This addition if for the Carbon River and Carbon River Road and provides the NPS land to develop visitor facilities with the changes with the decision for the Carbon River entrance and Road in the NP. This land was part of a land trade with private timber companies who owned the land and the USFS. The land in between this parcel and the NP is under the ownership and management of the USFS and is included in the overall management of the Carbon River to protect and preserve the natural resources. Future.-- It's unlikely there will be any significant changes in the NP boundary for a number of years. Not because of the need for new land to be incorporated into the NP, such as along the Carbon River corridor and along the northern boundary on the north side of the Carbon River, but because the resources just aren't there unless it's between the USFS and the NPS. Most of the land surrounding the NP belongs to the USFS, much of it already harvested for timber, so any additional lands would have to be close to pristine. The remaining surrounding lands under private ownership would have to come with either a land swap or a big check as we saw with the 2003 land, when the negotiations for the deal and the money was long and hard. Personally I'd love the NP to be enlarged, but as noted there isn't much around it that would help. Some of the surrounding land is already under wilderness designation so it's protected and doesn't fit into the NPS mission for Mt. Rainier or enhance the visitor's experience. The rest is already clearcut or will be in the future. It is sad to me that you can go to the NP boundary to gaze out over clearcut forests, knowing the last pristine forests in the area are in the NP now or the wilderness areas around it. It's the simple matter now of protecting and preserving what we have. There aren't any specific resources about the NP boundary, it's history is tucked inside the history of the NP itself, often lost in the text about who, what and when, only occasionally where the boundary was changed. Much of what is presented on the description and here is from books about the NP and maps of the NP.